On Apr. 6, 2018, the industry's best got dressed up in their finest and gathered at the Skin Games Live Show in San Ramon, California, as they eagerly waited to see who would be crowned with esthetic and makeup achievement. Stephanie Andresen took home the Esthetician of the Year Award, as well as many others. Other winners included Richard Maher for Holistic Esthetics, Jennifer Dover for Pigmentation, Roxanne Drese for Age Management, Brittany De Anda for new esthetician, and a number of others, as outlined below. Skin Inc.'s senior managing editor Katie Anderson attended the event as a judge in both the hyperpigmentation and new esthetician categories. 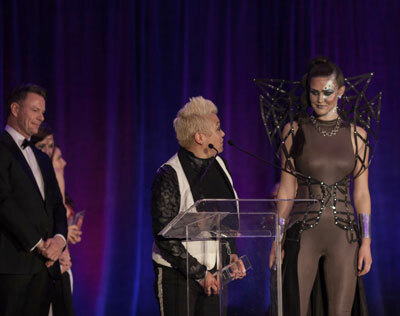 As the semi-finals to the Skin Games' debut Makeup Challenge were hosted at Skin Inc.'s Face & Body events in Rosemont, Atlanta and San Jose, we were especially excited to bestow the first Courage in Color Award to makeup artist Tamiko Carillo, seen in the photo to the right. This award honors the spirit behind the makeup artist, recognizing their ability to make their passion come to life. Stay tuned to a future issue of Skin Inc. for exclusive interviews with both Carillo and Player of the Year winner Stephanie Andresen. Below is a list of all winners of the Skin Games 2018.